The face of New York City is set to change once again, as another iconic landmark is about to be torn down. 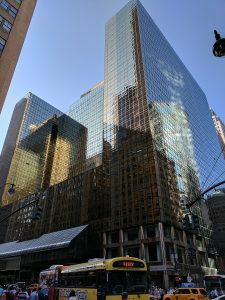 The Grand Hyatt, situated east of the Grand Central Terminal, is closing its doors to make way for a smaller hotel but with more office and retail space. Forbes reveals that mass construction will officially commence in 2020, a 101 years after the Grand Hyatt was first built as the Commodore Hotel. It served as one of the city’s leading hotels until the '60s when it hit financial trouble. President Donald Trump, the real estate mogul he was then, revived it a few years later and turned it into the Grand Hyatt Hotel that is today. The Grand Hyatt’s status as a an iconic building in New York City is now left uncertain, but Deputy Mayor for Housing and Economic Development Alicia Glen assures that the change is only going to add to the value of the neighborhood as a business district. A development group composed of TF Cornerstone and MSD Partners are handling the project and it has been revealed that the new building will reach an estimated 2 million square feet. To compare, One Vanderbilt, the skyscraper in construction on the other side of the Grand Central, totals 1.6 million square feet. Plans to redevelop the Grand Hyatt Hotel are a direct result of the rezoning in Midtown East where it is located. Former mayor Michael Bloomberg was the first to seek rezoning in the area while he was still in office, to no avail. It wasn’t until 2017 that the City Council approved the proposal to rezone over 70 blocks in Midtown which is supposed to compete with other business districts such as Hudson Yards and the Financial District, which are doing equally well. The rezoning will result in the construction of skyscrapers, the Grand Hyatt and One Vanderbilt included. One of the objectives of the rezoning plans is also to renovate public transportation within the district including the Grand Central. The developers of the Grand Hyatt promised that they will also touch on improvements to the terminal when construction begins a year from now. Though there will still be a luxury hotel in the place of the future Grand Hyatt, albeit at a much smaller scale than its current 1,209-room size, the emphasis will be on using the complex for retail and office space. Instead of choosing to redevelop the property as a residential space, it makes more sense for the purpose of the rezoning to add retail and office space in the district. Homes are currently taking longer to sell in New York City, which is expected to last for some time. In a post by Yoreevo entitled ‘Guide to Buying a New Development in NYC’, they outlined how ‘many banks require a new building to be at least 51% sold before they’ll lend within it.’ It means that it's great to be a buyer at this time as you can strike deals directly with sellers. The caveat is that property developers will have to bend over backwards to sell residential property than if they were to focus on selling commercial property. For more news about the Big Apple, stay tuned to Travel Communication.